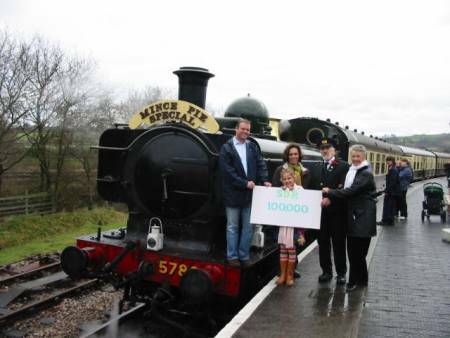 The 100,000th passengers were Spencer Crawford and his eight-year old daughter Grace, who live locally in Buckfastleigh, and Spencer’s mother Shirley Crawford who is visiting from Adelaide in Australia. The upper picture shews loco 5786 working the 12.15 Mince Pie Special train on 31/12/07 with a large Edmondson style railway ticket as a prop at Buckfastleigh, the Crawford family and Stationmaster Mick Stephens. The lower picture also shews 5786 but at Totnes and includes Spencer's wife Yasmin who had been left behind at Buckfastleigh! A cameraman and reporter from ITV Westcountry were at Buckfastleigh when they left on the 1215. The Crawford family enjoyed a ride to Totnes and also received vouchers for a family round trip in 2008 and two tickets for a Devonshire Pullman dining train also in 2008. The fireman for the day was Toby Roberts and the final passenger figure for the year seems to be 100,226. The highly scenic seven-mile, former Great Western Railway branch line, which runs down the glorious valley of the River Dart from Buckfastleigh to Totnes, was sold off by the Dart Valley Railway company in 1991 as being ‘uneconomic’, but the SDR is now proving otherwise. As one of Britain’s oldest heritage steam railways having first opened in 1969, the SDR has now chalked up a grand total of 1,336,896 passengers since it took over the line 16 years ago, with increasing numbers every year. The SDR has painstakingly recreated the ‘Golden Age of Steam’ over the ex GWR branch line which was first closed to passengers 49 years ago in 1958 before the infamous Beeching axe swung in the 1960’s and shut down many rural routes across the South West. Passing through some of the West Country’s most delightful rural scenery, the SDR prides itself on the quality of its heritage experience and literally transporting visitors back in time to the heyday of the old GWR, a fact recognised by Ian Allan Publishing’s judges in awarding it the prestigious title of ‘Heritage Railway of the Year’ earlier this month. South Devon Railway Chairman Alan Taylor said: “We’re all very chuffed that 2007 has already proven to be our best year ever with a record number of passengers and successfully breaking through the 100,000 passengers barrier, plus winning the award as Heritage Railway of the Year, for the first time. 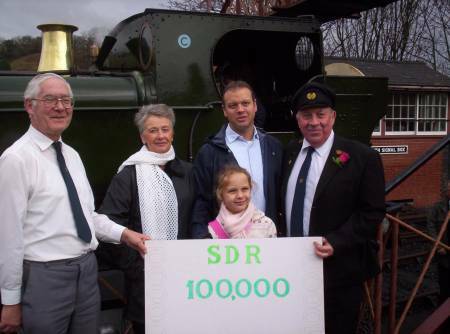 “We have achieved these milestones by not only broadening the SDR’s nostalgic appeal to visitors of all ages, but also by actively marketing the railway as one of the best ways for people to see the Devon countryside. “The SDR operates nearly all year round and we have a number of great special events to look forward to. “In 2008, we will mark the 50th anniversary of the closure of the line to passenger traffic by British Railways with a special event in the late Autumn.